Cheap Mama Chick: $12.80 for $32 Worth of Comfortable, Cute Kid's Shoes from Pedoodles! $12.80 for $32 Worth of Comfortable, Cute Kid's Shoes from Pedoodles! 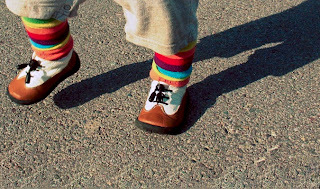 Through Plum District today pay just $12.80 for $30 worth of Pedoodles shoes for the little ones! If your new to Plum District pop over here and grab a free Plum District account (just an email required). The find this deal here- $16 for $32 Worth of Comfortable, Cute Kid's Shoes from Pedoodles. Use code 'FLASH20' for the additional 20% off the $16 deal price (flash code ends at 5pm tonight).